What's silver, has two wings and FLIES? Why, today's Nice Price or Crack Pipe 260Z of course. With low miles and a pair of questionable mods, the real riddle is how much bread should someone pay for this silver Zed? My loss - your gain. That's what the seller of yesterday's Lotus Turbo Esprit claimed in his ADHD-targeted ad, and the car's price made fully 73% of you gain a pants tent over the thought of ownership, for a Nice Price win. The Esprit had its roots in the ‘70s, and so did Nissan's game changing sports car, the S30 Z-car. When the then Datsun branded Z debuted on the cusp of the disco decade it suddenly made the cheap British sports cars seem like something Charles Dickens might drive. Likewise its unmuted sexiness married to reliable operation doomed the cheap seat Italians to whatever it is they've been doing ever since. What Would Charles Dickens Have Driven? However, even the wily Japanese can get it wrong on occasion, and so without further ado we give you the 1974 260Z. Don-don-daaa! It's not that the 260 was actually such a bad car, but the one-year in the U.S. model simply missed the target for drivability and performance. You see, despite a 172-cc bump in the L-series engine size (2,565 vs. the 240's 2,393) additional work to reduce emissions robbed the car of 10 horsepower, dropping it to 140. That performance-blunting horse thievery was abetted by the 260Z's greater heft, being differentiated from the 240 by a strengthened platform and bumpers that were no longer made from rice paper and haiku. On the plus side, the interior received some enhanced ergonomics and at least those bumpers aren't the sumo wrestlers marring the 280Z. The '74.5 260s were burdened with these, but this earlier edition is more pleasing to the eye if not your insurance agent. 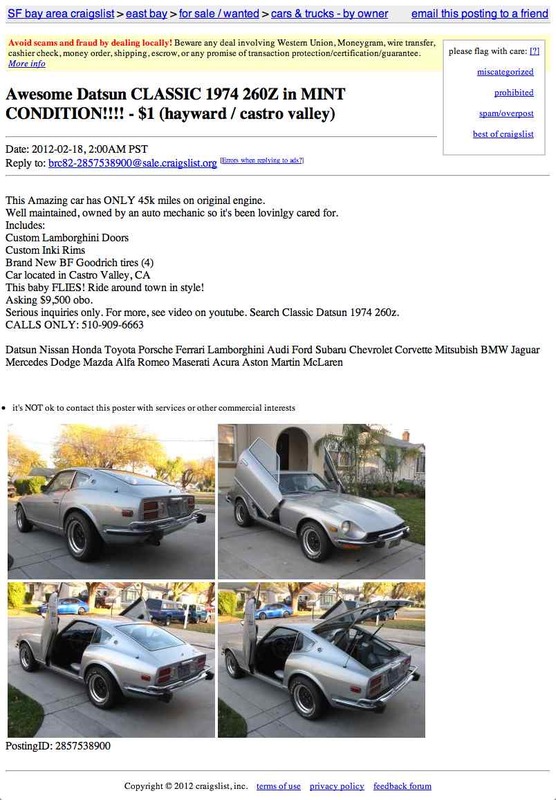 The seller of this particular 260Z says in his ad that it flies, and advocates riding around town in style, which one would assume to mean doing so in this silver 45,000 mile Z-car. At a cursory glance it seems stylish enough, looking pretty stock with the exception of its ‘custom Inki' wheels - by which I think he means Enkei - and the tail light panel now being body color rather than grey. It's also missing the rubber extensions for the bumpers which keep crumbs from hitting the ground when you eat crackers over them. Another claim made in the ad is that the car is in mint condition, and like many a confectionery treat that wintry flavor, this Z hides a surprise. Unfortunately, that surprise is not a liqueur-infused cherry, but the fact that the doors now open skyward rather than the traditional funky chicken fashion. Okay, lets get this out of the way, Lambo doors are so played even Lambos don't have Lambo doors any more - sad trombone. I guess this seller doesn't abide the meme. At any rate, check out the video here to see how those doors insides are covered in space age silver as are the bolsters of the seat covers making the whole interior look like a set piece from Barbarella. Props for Stevie Ray Vaughan and Double Trouble! Okay, so let's recap and look at this car's pros and cons. The 260Z is not the most desirable S30 model - but at least it's not an automatic 2+2. The Lambo doors are a definite demerit - unless those are really working for you in which case you will probably be put off by its total lack of under-car fluorescent lighting. The overall condition of this car is pretty good plus there are 4 new BFGs. However, the seller suffers from excessive exclamation point syndrome, making the ad annoying!!!! And the price for all this yin and yang is $9,500. It's up to you to decide on which side of the coin that falls. 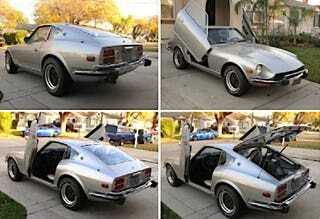 What do you say, does $9,500 open the Lambo door to 260Z ownership? Or, is the price the least of this car's problems? San Francisco Craigslist or go here if the ad disappears. H/T to billybo for the hookup!